Sunnyside Dru: who called it?! A couple of local weather prediction professionals missed this snow. And the last one too. I've started following a few one line that do a better job reading the maps and letting a farmer's wife be prepared. All pens were moved yesterday to a bit higher spots. Liquid water a couple of tines, because today there is nothing but snow and really really cold temperatures. Single digits. 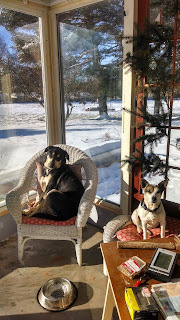 The dogs are happy on the sun porch. The eggs. They were fine when taken from the nest. Left in the basket on top of one of the pens while chores were completed they froze and cracked. Farmers breakfast tomorrow.